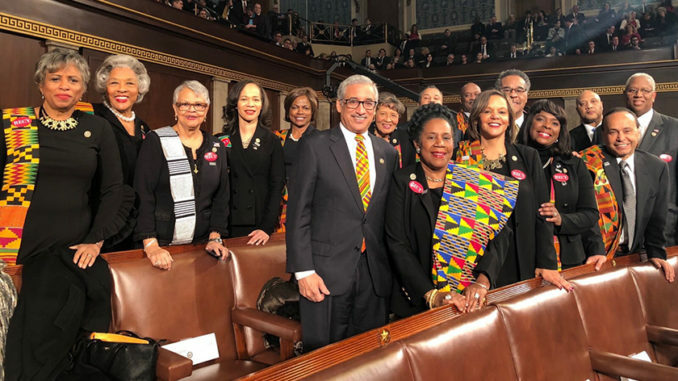 —Members of the Congressional Black Caucus wore Kente cloth-inspired prints to the State of the Union address standing in solidarity with Americans, Haitians and the African nations smeared by President Trump’s racist rhetoric. —The Black unemployment rate is almost double the White unemployment rate, a trend that has endured for decades. Rep. Cedric Richmond, the chairman of the Congressional Black Caucus railed against President Donald Trump’s boasts about the economy, especially his claims about the Black community, in a blistering response to the president’s State of the Union (SOTU) address. CBC members also wore Kente cloth-inspired prints to the State of the Union address. Richmond said that every action taken by President Trump, since his election, has been destructive for poor, working-class, and middle-class communities throughout the country, as well as communities of color. Richmond said that nothing that the president said during his speech wiped that slate clean.